– For the first time in five years, a horse has made the cover of Sports Illustrated. (That’s the power of an upset in America’s best known race and a fantastic, scrappy backstory.) 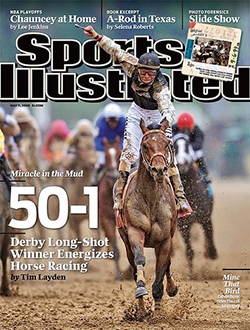 “Miracle in the Mud: Derby Long-Shot Winner Energizes Horse Racing,” asserts the headline accompanying the photo of Mine That Bird and Calvin Borel after the wire. Even with a few days to think about it, I’m still not sure what to make of the freakish Kentucky Derby results. I believe this, though: There are no miracles, and there are no fairy tales; there is only missing information. Something essential about Saturday remains unknown. I’m waiting for the Preakness, as Superfecta advises, before coming to any conclusions about Mine That Bird, this year’s 3-year-old Classic contenders, or what the Derby means for racing. Maybe after the second leg of the Triple Crown, I’ll feel energized. For now, I remain slightly stunned and disoriented. The two are terrific racing stories: Both Kentucky-breds, each was purchased for a modest price at a Keeneland sale and shipped to South America, where both became winners. Canonero, however, arrived in the United States two weeks before the Kentucky Derby, losing four days training time in quarantine, and little was known of his record when he went to post at Churchill. His 3 3/4-length Derby upset was considered a fluke, a notion dispelled when he won the Preakness in record time. Canonero then headed to New York to try for the Triple Crown, where he stunned fans by finishing fourth in the Belmont as the 3-5 favorite. Dan Illman has much more on the 1971 Derby winner, including video links. – For conspiracy buffs, a theory. – For Borel fans, proof of form. – New debut date for Zenyatta: After scratching last Friday from the Louisville Distaff due to rain, trainer John Shirreffs has set the May 23 Milady Handicap at Hollywood as the race for the mighty mare’s return.